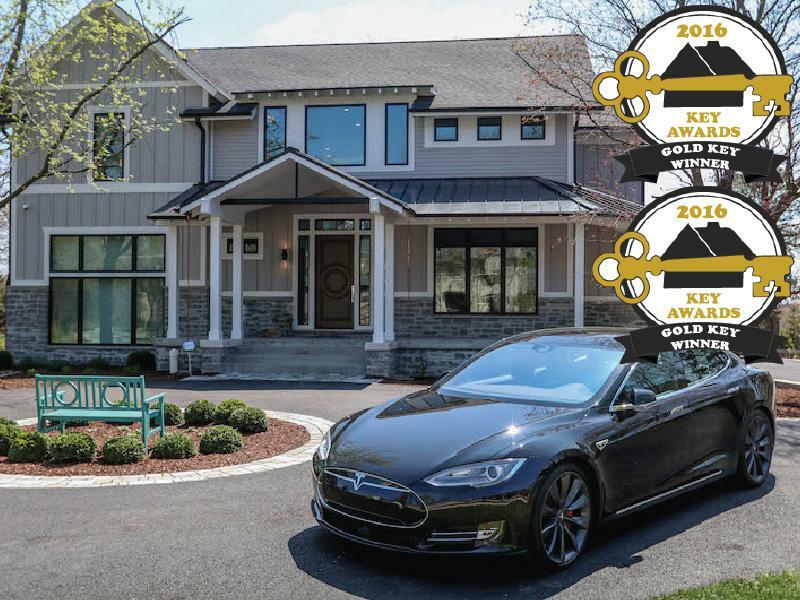 DJK Custom Homes receives two 2016 Gold Key Awards from The Home Builders Association of Greater Chicago for DJK's second built Net-Zero Energy and LEED Platinum certified home in Naperville. DJK Homes received the Gold Key Award for Outstanding Design in New Construction Architecture and Outstanding Design Excellence in High Performance for Green Construction. The Key Awards recognize excellence in housing design, architecture, interior merchandising, landscaping, landscape architecture and remodeling. DJK Custom Homes first Eco-Smart Home The Grand Teton has received Green Home Institute's highly renowned Zero Energy Capable Certification for designing, building, and 3rd Party testing Naperville's first home that is capable to achieve producing more energy than consumed over the course of an average year. The local Naperville community has fallen in love with the design and concept of the new Net-zero home located on Knoch Knolls Road in Naperville. The Earth Day Grand Opening Event over the course of the entire weekend welcomed close to a thousand visitors! Naperville's Second Net Zero House from Naperville News 17 on Vimeo. DJK Custom Homes partners with Independence Renewable Energy and Suniva to feature Suniva's high-powered Optimus modules to power Eco-Smart Home and open the doors to the public for the newly completed Eco-Smart Home in Naperville on Earth Day, April 22nd. The news has broke about DJK Homes building Naperville's second Net-Zero Home a part of the Eco-Smart series of performance homes. The new “Modern Farm House” Eco-Smart Home is set to be unveiled by DJK Custom Homes on Earth Day April 22nd. The new Eco-Smart Home will utilize many advanced green building techniques, practices, and products to achieve net-zero status. Some of the key features in the home include VELUX solar powered fresh air skylights in the central area of the home and VELUX Sun Tunnel Tubular skylights to address lighting needs and additional energy efficiency. With the success of the The Grand Teton Eco-Smart Home by DJK Homes, CertainTeed has partnered with DJK Homes to provide healthy indoor air quality by installing CertainTeed Air Renew Drywall in DJK Homes next Eco-Smart Home project, The "Modern Farm House" Eco-Smart Home. DJK Homes has also made the change to installing CertainTeed Air Renew Drywall in all new custom homes as a standard feature in the homes. Following the open home tours for DJK Homes Eco-Smart Home in Naperville. There is still a great amount of buzz in the local community about the new push to build green sustainable and energy efficient homes in the area. The local community surrounding the Eco-Smart Home in Naperville love the design and the meaning behind building an energy efficient, environmentally friendly, and healthy home. There has been a great amount of buzz and feedback from the local community regarding the various technologies that have went into making the Eco-Smart home one of Naperville's greenest homes. This attention has caught attention of The Chicago Tribune. The news has broke about DJK Homes building Naperviile's first Net-Zero Home powered by 100% Solar Energy. The home is designed to be the greenest and healthiest home in Naperville. We are proud to announce that our Grand Teton Eco-Smart Home in Naperville has achieved LEED Platinum level certification. Our Grand Teton Eco-Smart Home is the very first residential home in the Naperville area to receive this presitigious level of recogniction.